I’m sure many of you have either bought roasted chickpeas or made your own at home. Roasted chickpeas are very easy to make and they make a delicious, healthy snack you can enjoy any time. As for kale salad, it’s a staple at my house and in the warmer months I eat it couple times a week when I want something light and fresh. Raw kale can be a bit intense, so to soften it up and reduce the bitterness before in this salad, I massaged it with a little olive oil and fresh lemon juice. 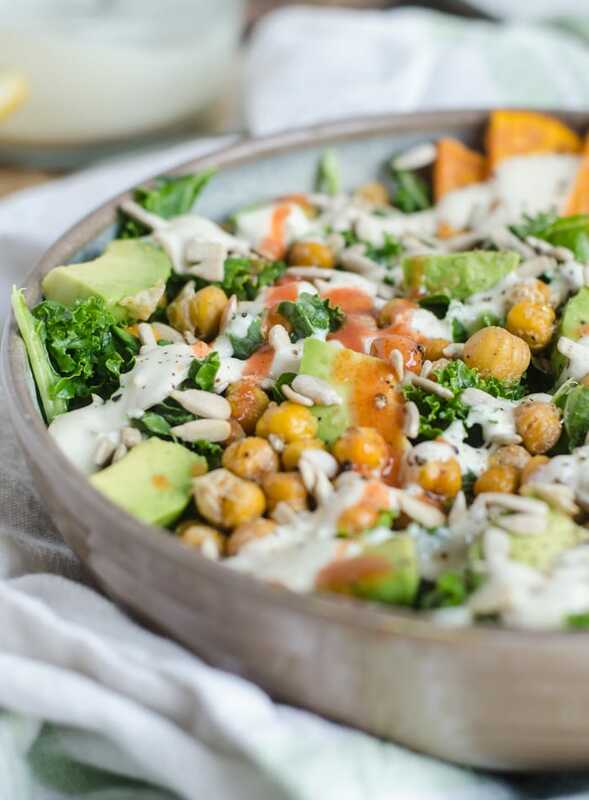 This Roasted Chickpea Kale Salad combines some of my favourite ingredients and there’s a good chance they’re on your list too. How about avocado, roasted chickpeas, sunflower seeds, roasted sweet potato and tahini? Yep, sounds pretty amazing, doesn’t it? The best thing about roasted chickpeas is you can make them with countless different flavourings for a different result every time. You can make them sweet. savoury, spicy or my personal favourite, sweet and salty. They’re also incredibly easy to make. You can use canned chickpeas or cook your own. I sometimes cook a big batch of chickpeas as part of my weekly food prep but more often than not, I used canned chickpeas for their convenience. When choosing canned chickpeas you want to look for one with a BPA-free lined can. I like Eden Foods Garbanzo Beans which I can usually find on sale at my local natural food store. Before roasting, you’ll want to drain the chickpeas and give them a good rinse. Then, and more importantly, you’ll want ot use a paper towel or dish cloth to dry them off as much as possible. Some of the skins will come off when you’re drying htem but no matter, just pick them out or leave them as they crisp up nicely when roasting. I don’t take the time to remove all the skins from my chickpeas and I don’t think it’s necessary to do so. 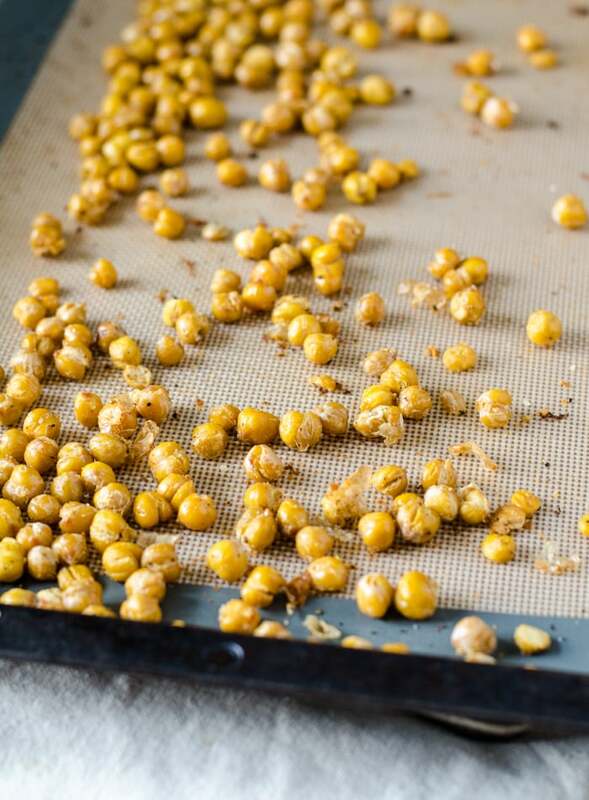 Afte ryou’ve dried thte chickpeas off, place them on a baking sheet lined with parchment paper or a silione baking mat. I love my silicone baking mats because they last forever and they’re re-usable so you don’t have ot keep buying parchment paper. You can grab them on Amazon for under $20 for a pair of them. They’re a must-have for my kitchen and I recommnend grabing some to use for everything from these chickepas to the roasted sweet potato, to baking and more. Ok, so you’ve got your dried chickpeas spread out on a baking pan. Now add 1/2 tsp of olive or avocado oil per 19 oz. can of chickpeas (about 2 cups). Next add your spices! There are countless ways you can spice your roasted chickpeas. A simple go-to is sea salt and black pepper. For this recipe, I used garlic powder, sea salt and black pepper. I’ve listed more ideas below for flavouring roasted chickpeas, there is really no wrong way to go, so feel free to experiment. NOTE ON USING OIL: If you prefer, you can make roasted chickpeas without oil however using a small amount of olive, coconut or avocado oil will result in a crispier chickpea. I’ve seen recipes use up to 2 tablespoons of oil per 2 cups but I find that to be too much. Most recipes will call for about a tablespoon of oil but I still find that to be more than necessary. I only use about 1/2 a tsp of olive per 19 oz. can and I like the result I get with that amount. Cheesy Roasted Chickpeas: garlic powder, onion powder, nutritional yeast, salt and pepper. As you can see, any flavour combination you can think of will work for roasted chickpeas. If they can put it on a chip, you can put it on roasted chickpeas. That’s it! 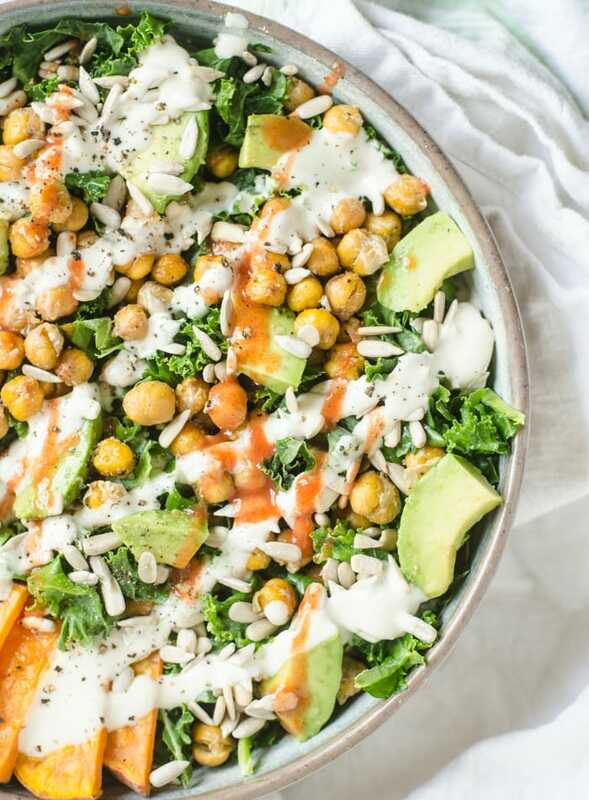 It’s a fairly simply salad made with everyday, whole food ingredients and after you slather it all with tahini lemon sauce, you’ll be in roasted chickpea kale salad heaven. To make the tahini stretch a little further, I thinned it with lemon, apple cider vinegar, water and sea salt. If you don’t feel like mixing up a dressing, you can just drizzle the tahini right over your salad and dig in. I wanted this salad to be extra creamy so I mixed the tahini with tangy ingredients like lemon, vinegar and sea salt. This way you get an amped up version of tahini that goes perfectly with the rest of the ingredients and you’ll have enough for an extra creamy, saucy salad. I love the combination of tahini, lemon and hot sauce, so I also added a good drizzle of hot sauce to mine. 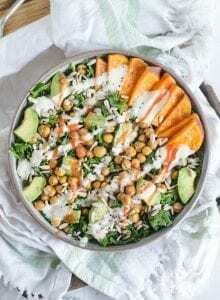 If you’re pinched for time, instead of mixing up the lemon tahini sauce, top your salad with a drizzle of tahini, hot sauce, lemon, sea salt, black pepper and just dig in. Raw kale can be a little rough, intense and bitter. I recommend massaging the kale with a tiny drizzle of olive oil, spritz of fresh lemon juice and pinch of sea salt before using. Make sure you tear the kale leaves away from the thick stems as those can be very hard to digest. I use my hands to tear the kale off the stems then rip it up into bite-size pieces. You can also use a knife to chop it up. After you’ve torn or chopped the kale up, add a quick drizzle of olive or avocado oil, give it a good spritz of fresh lemon juice and pinch of sea slat and then use your hands to work it all in so each piece of kale gets coated. Set aside for 5 or 10 minutes to allow the kale to soften. The recipe will make enough chickpeas and sweet potato for about 4 salads, adjust the rest of the ingredients accordingly for how ever many you’re serving. The sauce recipe makes enough dressing for one large salad, double or triple as needed. I did not give exact amounts for the salad ingredients. 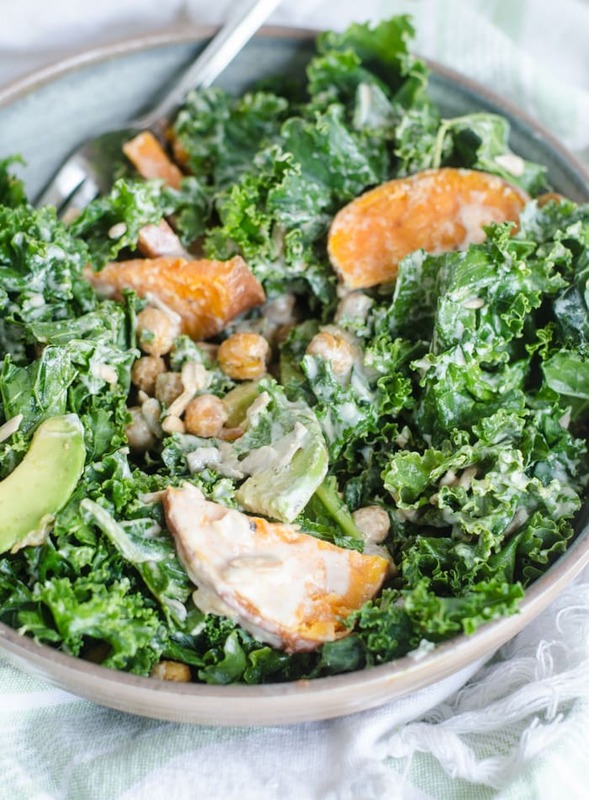 To make one large salad I used a few big handfuls of kale, 1/4 of an avocado, a few tablespoons of sunflower seeds, 1/4 of the chickpeas and about 1/4 of the sweet potato. You can store any extra chickpeas in an air-tight container and any extra sweet potato in the fridge to enjoy later. I hope the recipe all makes sense, please let know if you have any questions as I’m not super exact with salad recipes. You can add any other veggies you want, you can replace the sunflower seeds with another nut or seed if you prefer, or even use a different dressing. Like many Running on Real Food dishes, this recipe is more of a guideline to inspire you to get creative and have some fun in the kitchen. Don’t forget to tag me on Instagram and use #runningonrealfood so I can check out your creations, it seriously makes my day every single time. Alright, guys. Let’s get into this salad. I very much hope you enjoy it. 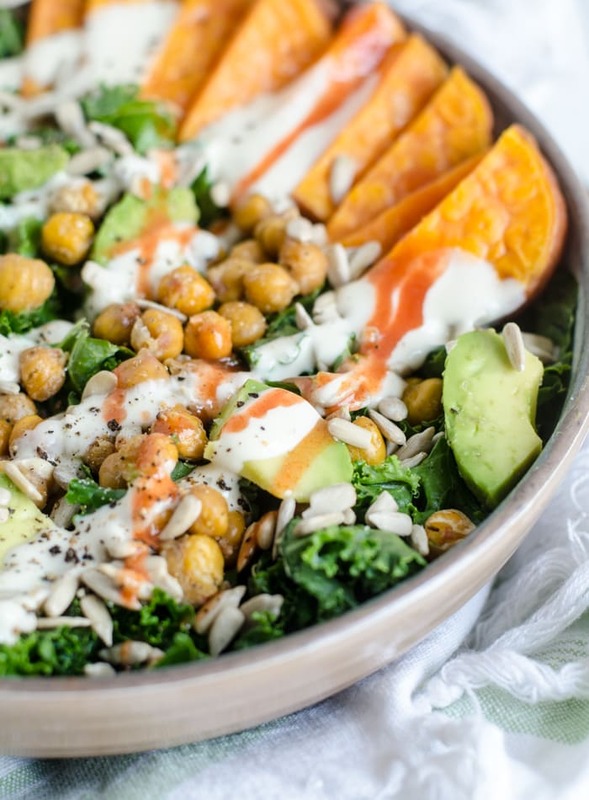 This Roasted Chickpea Kale Salad features sweet potato, avocado, sunflower seeds and lemon tahini sauce. It’s easy to make as you can roast the chickpeas and sweet potato all at once while you prep the rest of the salad. It’s creamy, flavourful, has all the texture you could ask for and it’s absolutely packed with nutrition. Use a paper towel or cloth to blot the chickpeas dry. Place on a parchment or silicone baking mat-lined baking sheet. Drizzle with the oil then sprinkle with garlic powder, salt and pepper then roll them around until they’re all coated. Cut sweet potato into desired pieces. I cut mine into rounds. Toss in a bowl with the oil until well coated. Roast in the oven for 25-40 minutes (will depend on size you cut them), flipping half way through, until tender and starting to brown. Add the tahini, lemon and vinegar to a small dish and stir vigorously to combine. It may seize up a bit but it will smooth out once you add water. Slowly add water, 1 tsp at a time until you reach desired consistency. While the chickpeas and sweet potato is cooking, prep the kale then massage it with a tiny drizzle of olive oil, lemon and sea salt. Use your hands to work it until each piece is coated. Let sit for 10 minutes or so to allow it to soften. Top with sunflower seeds and avocado. Add the chickpeas and sweet potato once they’re ready. Drizzle it all with the lemon tahini sauce and if desired, hot sauce, more lemon and a sprinkle of salt and pepper. I just found my dinner for tonight!! This looks AMAZING. This loooks amazing!! I am definitely going to be making this! Thanks for sharing!!! You’re welcome! Can’t wait to hear what you think, let me know when you try it! OHH this looks so yummy, can’t wait to try it. And for once I find a recipe where I actually already have all the ingredients. Haha, I hear ya. It’s the worst when you want to make a recipe but you don’t have even half the ingredients. The ingredients seem pretty long for this but it’s actually quite simple and easy to make. I hope you enjoy it!! Do let me know what you think! This looks SO good. 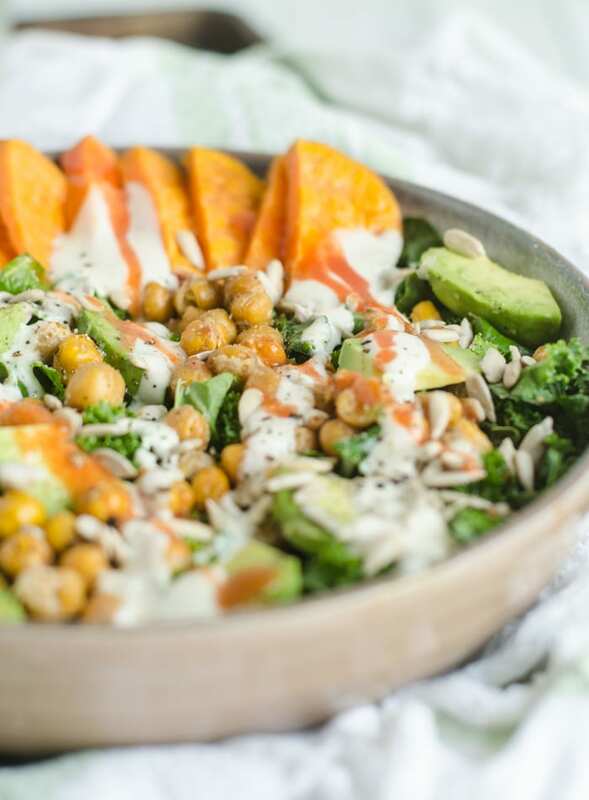 Roasted chickpeas are one of my favorite foods and this salad combo is next level. Can’t wait to try it! Yes! I LOVE roasted chickpeas…thank goodness for the first person to come with the idea for crunchy, salty, roasted chickpeas. You’ll love them with the tahini, avocado and sweet potato. So good!! Hope you enjoy it! This is the salad of my DREAMS! I do roast chickpeas quite frequently and love tossing them in salads like this! Haha, right? SO YUMMY. I love them for salads too, just adds that extra ooomph. Beautiful pictures! I will have to try out this recipe! It looks delicious! I love everything about this salad! It’s filled with so much goodness! Definitely a must make! This bowl is GORGEOUS! Definitely my kind of meal 🙂 Love it! Haha, I find that happens a lot with some of my blogger buddies! Even posting similar recipes on the same day. Balsamic tahini dressing sounds amazing. I also tried this with a herbed vinaigrette but tahini was def the way to go! I can’t wait to hear more about your book!! Omg this looks too good.. This looks so delicious ???? Wow this looks incredible, and extremely healthy! I will definitely be giving it a try. I’m wondering if you have ever tried cooking with essential oils? It would be very easy to add some to the dressing of this recipe! I’ve never cooked with them no. I use them in my home but I’ve never tried them in recipes! Thank you so much, Rachel! I hope you like it, let me know when you try it! This salad is screaming my name! So much flavor and texture, and I love the added protein with the chickpeas! This is definitely my kind of meal! And I love all the different flavor combos for the roasted chickpeas! Awesome, let me know how you like it!! Massaging the kale makes such a big difference, the texture and taste is so much better that way! Hope you enjoy it! I love trying new salads! I love everything about this one! My family will love sharing it with me too!! This looks so good and so healthy! Thanks for sharing, can’t wait to try it! You’re so welcome! I agree, hummus is the best!! Thanks for your comment, let me know if you try the recipe! Wow LOVE this. 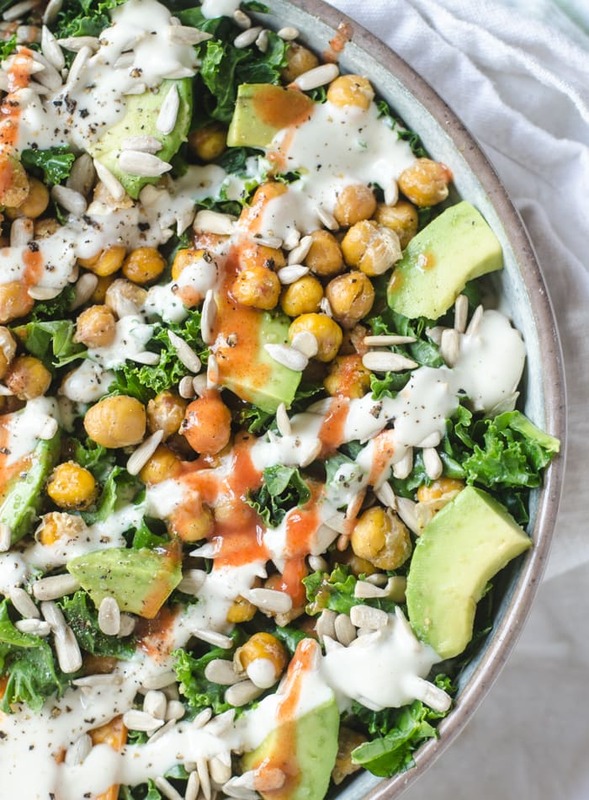 Love kale salads and yes to lemon tahini! Such a great combo. Also love how detailed your steps are for roasting chickpeas! I remember feeling a little lost the first time I roasted chickpeas so this is perfect. Your dish look so delicious! I’ve never tried making chickpeas salad before, but after reading your recipe I feel like I have to. Thank you for sharing!